I’m a master`s course student at Kobe University. My research is focusing on systematic study of Ichneumonid wasps, in particular nocturnal subfamily Ophioninae and diurnal subfamily Anomaloninae. See my personal website for detail profile and achievements . 24) Shimizu S (2017) New record of the subgenus Weisia Schmiedeknecht of the genus Phytodietus Gravenhorst (Hymenoptera: Ichneumonidae: Tryphoninae) from Taiwan. 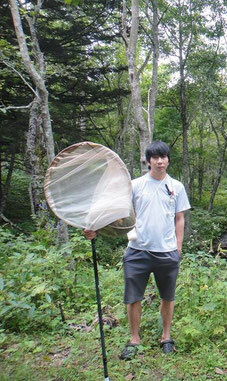 Japanese Journal of Systematic Entomology 23 (1): in press. 23) Kodama M & Shimizu S (2017) Collection of terrestrial amphipods using a yellow pan trap. Crustaceana in press. 22) Shimizu S (2017) Description of a new species and revised key to species of the Enicospilus antefurcalis species-group from Japan (Hymenoptera: Ichneumonidae: Ophioninae). Acta Entomologica Musei Nationalis Pragae 57 (1): in press. 20) Shimizu S & Maeto K (2016) Three Oriental species of the genus Enicospilus Stephens (Hymenoptera: Ichneumonidae: Ophioninae) newly recorded from Japan. Japanese Journal of Systematic Entomology 22: 203–207. 19) Shimizu S (2016) Distributional notes on Leptophion giganteus Shimizu & Watanabe, 2016 (Hymenoptera: Ichneumonidae: Ophioninae). Japanese Journal of Systematic Entomology 22: 199–201. 18) Shimizu S & Konishi K (2016) New record of the genus Dictyonotus Kriechbaumer, 1894 (Hymenoptera: Ichneumonidae: Ophioninae) from Vietnam. Japanese Journal of Systematic Entomology 22: 159–160. 17) Shimizu S & Watanabe K (2016) A new record of Ammophila atripes japonica Kohl, 1906 (Hymenoptera, Sphecidae, Ammophilinae) from Katsuyama City, Fukui Pref., Japan. Tsunekibati 29: 36–37. 16) Shimizu S & Fujie S (2016) Recognition of a remarkable morphological deformity on Dictyonotus purpurascens (Smith, 1874) (Hymenoptera: Ichneumonidae: Ophioninae). Tsunekibati 29: 34–35. 14) Katayama E, Watanabe K & Shimizu S (2016) Additional records of Ichneumonidae in Tochigi Prefecture, Japan. Insect 67: 16–22. 13) Shimizu S (2016) Aphanistes nocturnus Lee & Choi, 2004 (Hymenoptera: Ichneumonidae), new to Japan. Japanese Journal of Systematic Entomology 22: 51–54. 12) Shimizu S (2016) Agrypon triangulum Uchida, 1958 (Hymenoptera: Ichneumonidae: Anomaloninae), new to Taiwan of the Oriental region. Japanese Journal of Systematic Entomology 22: 39–41. 10) Okatsu Y & Shimizu S (2015) Collection record of Panesthia angustipennis spadica (Shiraki, 1906) (Blattodea: Blaberidae: Panesthiinae) in Kanayama town, Yamagata prefecture, Japan. Idehanomushi 11: 45. 6) Shimizu S & Watanabe K (2015) Discovery of Leptophion radiatus (Uchida, 1956) (Hymenoptera: Ichneumonidae: Ophioninae) from Laos. Japanese Journal of Systematic Entomology 21: 205–206. 4) Shimizu S & Watanabe K (2015) The subgenus Weisia Schmiedeknecht, 1907, of the genus Phytodietus Gravenhorst, 1829 (Hymenoptera: Ichneumonidae: Tryphoninae), new to Japan and Eastern Palearctic region. Japanese Journal of Systematic Entomology 21: 65–67.